Israel Idonije, O.M. (born November 17, 1980) is a retired Nigerian-Canadian defensive end NFL player. Idonije was signed as an undrafted free agent by the Cleveland Browns out of the University of Manitoba. A draft pick of the now defunct Ottawa Renegades of the Canadian Football League, for whom he never played a game, Idonije spent the start of the 2003 season on the Browns' practice squad prior to his release in September. He was subsequently signed to the Chicago Bears' practice squad for the final six weeks of the season. He has also played for the Detroit Lions, Chicago Bears, and New York Giants. Idonije was born in Lagos, Nigeria and immigrated with his family to Brandon, Manitoba, Canada, when he was four years old. He attended Vincent Massey High School in Brandon and, though he had never played football and was reluctant, coach Kevin Grindey convinced him to play when the school restarted its Canadian football program in 1997, when Idonije was a senior in high school. He went on to play CIS football for the Manitoba Bisons. During this time he worked as a daycare teacher in Winnipeg, Manitoba, played in the East-West Shrine Game, and was drafted 17th overall by the Ottawa Renegades in the 2003 CFL Draft. At Manitoba from 2000–02, Idonije recorded 16 sacks which stands fourth all-time in Bison history. He helped lead the Bison to the 2001 Vanier Cup where Manitoba was defeated by the Saint Mary's Huskies. In 2002, Idonije was named 2002 Manitoba Male Athlete of the Year. His goal, however, was to play in the National Football League. Idonije was not invited to the NFL Combine, but appeared on his own to distribute tapes of his years at University of Manitoba. Nine NFL team scouts were originally scheduled to attend a subsequent workout in Manitoba, but only one team, (the Cleveland Browns) ended up attending due to the SARS outbreak concerns at the time. As a rookie in 2003, Idonije was signed by the Browns as an undrafted free agent, and put on Cleveland's practice squad. He was waived by the Browns midway through the season. 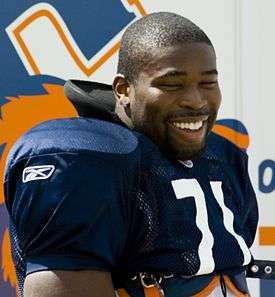 Idonije was obtained by the Chicago Bears as a practice squad player late in the 2003 season and made the final roster the following year. Idonije also played gunner on the punt coverage team. In 2006, the Idonije became a restricted free agent and the Buffalo Bills attempted to sign him, but the Bears retained him by matching their offer. During the 2007 NFL Season, Idonije had three consecutive games with a blocked field goal or extra point. In 2008, Idonije set career highs in sacks (3.5), tackles (22), and passes defensed (6). In May 2009, signed a two-year, $7 million contract extension with the Bears. On December 30, 2009 Idonije was placed on injured reserve due to a foot injury. In 2010, week 5 at the Carolina Panthers, Idonije recorded 3 sacks. In 2011, in week 15 against the Seattle Seahawks, Idonije scored his first NFL touchdown after a fumble recovery in the end zone after Tarvaris Jackson had the ball stripped by Julius Peppers. With the drafting of Shea McClellin in 2012, Idonije was moved to defensive tackle. In the second game of the preseason against the Washington Redskins, Idonije recorded 2½ sacks on rookie and Heisman Trophy winner Robert Griffin III. Idonije would once again record 2½ sacks in week three against the St. Louis Rams. Idonije ended the season with 40 tackles, 7.5 sacks, and a forced fumble, and he was later named to the USA Today All-Joe Team. On June 25, 2013, Idonije signed a one-year contract with the Detroit Lions. Idonije recorded 11 tackles and half a sack during the 2013 season. On March 18, 2014, Idonije signed a one-year deal to return to the Bears. The Bears released him on June 19, 2014. Idonije signed with the New York Giants on August 5, 2014. He was released on August 30, 2014. Idonije revealed his new comic, The Protectors, at its soft launch during the New York Comic Con in October 2012. He came up with the idea at the Chicago Bears training camp in 2007. The Protectors, set in the future, is based around a group of super athletes who learn they are blessed with super powers that help protect humanity. Idonije brought on writer Ron Marz and artist Bart Sears to complete the project. Idonije will be publishing the comic through the publishing company he founded, Athleta Comics. Athleta Comics is part of Athleta Entertainment. The Protectors issue #0 made its debut at C2E2 in Chicago, April 26–28, 2013. Issue #1 is scheduled to come out in September 2013. Idonije also created Sports Heroes, showcasing athletes through comic artistry, and Athlitacomics became an NFLPA licensee. Sports Heroes can be found on the first of its kind consumable NFLPI licensed product. Idonije along with Prakash Chand founded medical question and answer service AskTheDoctor.com. A portal allowing anyone, anywhere immediate access to a doctor. All-Star Football and Cheerleading Camps - an annual program that provides a free one-day camp to 250+ youth where they receive training in drills, conditioning and other techniques from athletes and coaches. IZZYz KIDz After-School Program - a daily program that provides a safe, constructive environment for youth. Africa Project - an annual humanitarian trip to West Africa to provide medical services and a youth sports empowerment program. Youth Leaders Summer Intern Program - a summer long job shadowing and career development program for high-achieving students from the IZZYz KIDz After-School Program. On June 10, 2013, Idonije was awarded the "Humanitarian Award for Excellence in Sports Philanthropy" by All Sports United, which recognizes one athlete per year that demonstrates exceptional commitment to public service. The Humanitarian Award carries with it a $100,000 media grant thru PVBLIC foundation. Idonije started Blessed Communion in 2009. Blessed Communion manufactures dual-chambered, pre-filled Communion cups for individuals, churches and other religious organizations. Idonije opened up an office, meeting and business event space in the South Loop. Manitoba Lieutenant-Governor Philip S. Lee announced on May 12, 2014 that Idonije is to be inducted into the Order of Manitoba. The ceremony took place at the Manitoba Legislature in Winnipeg on May 21, 2014. 1 2 Mayer, Larry (2013-02-13). "Idonije voted to USA Today's 'All-Joe' team". Chicago Bears. Retrieved 2013-02-13. ↑ "Idonije didn't let snub kill his dream". Chicagobears.com. 2009-02-18. Retrieved 2012-08-20. ↑ "NFL star serves as principal for a day at Winnipeg school". CBC News. 2009-03-11. Retrieved 2009-03-12. ↑ "Israel Idonije". Current Players. National Football League. Retrieved 2009-03-14. ↑ Taylor, Scott (October 2007). "Manitoba's Friday Night Without Lights" (PDF). Manitoba Score Magazine. Winnipeg: Manitoba Score Magazine. 1 (1): 25–29. 1 2 Mayer, Larry (2009-02-18). "Idonije didn't let Combine snub stop him from chasing dream". Chicago Bears. Retrieved 2009-03-12. ↑ "The Official Website of the Chicago Bears". Chicagobears.com. Archived from the original on August 27, 2012. Retrieved 2012-09-24. ↑ "Bills reach midpoint winless after loss to Bears". CBSsports.com. CBS Interactive. 7 November 2010. ↑ "Idonije leads sack attack in victory". Chicagobears.com. Retrieved 2012-08-20. ↑ Mayer, Larry (2012-09-18). "Bears cruise behind strong defensive effort". Chicagobears.com. Retrieved 2012-09-24. ↑ "Lions sign DL Israel Idonije to one-year deal, per league source.". Profootballtalk.com. June 25, 2013. Retrieved June 25, 2013. ↑ Dickerson, Jeff (June 25, 2013). "Israel Idonije agrees to join Lions". ESPN. Retrieved June 25, 2013. 1 2 Associated Press (March 18, 2014). "Bears bring back DL Idonije". The Washington Post. Retrieved March 18, 2014. ↑ David Smith, Michael. "Giants sign Israel Idonije". Pro Football Talk. Retrieved 5 August 2014. ↑ Florio, Mike. "Idonije out in New York". Pro Football Talk. Retrieved 31 August 2014. ↑ "NYCC: Football Star Israel Idonije Unveils 'Protectors'". USA Today. 2010-10-12. Retrieved 2013-05-24. ↑ "DE Idonije Turns Athletes into Superheroes". ESPN Playbook. 2012-01-25. Retrieved 2013-05-24. 1 2 "Israel Idonije Profile". InLeague. Retrieved 11 April 2013. ↑ "Comics Buff Israel Idonije Unveils his Superhero Tale at C2E2". Red Eye Chicago. 2013-04-25. Retrieved 2013-05-24. ↑ "NFL Players Inc. - Quarterback Gummies". www.nflpa.com. Retrieved 2015-09-03. 1 2 "Nigerian-born Israel Idonije Readies Himself for Annual Africa Trip". Yahoo Sports. 2013-01-16. Retrieved 2013-05-24. ↑ "Israel Idonije". WCIU, The U. Retrieved 2015-09-03. ↑ FOX. "Fox 32 Chicago News, Weather, Breaking News, Sports, Live Reports | WFLD". WFLD. Retrieved 2015-09-03. ↑ "NFL's Israel Idonije Breaks Bread - and Ground - with Blessed Communion". Black Enterprise. Retrieved 28 March 2013. ↑ "Israel Idonije's Hard Hitting Faith". The Christian Broadcasting Network. Retrieved 1 April 2013. ↑ "Sloopin - A South Loop Blog: Israel Idonije to Host Open House for His New Coworking Venture, The Bureau at 1420 S. Michigan Ave". www.sloopin.com. Retrieved 2015-09-03. ↑ "Order of Manitoba to welcome 14 new members". Winnipeg Free Press. Retrieved 2014-05-12.